A little more sand... Thank you for your patience! so simple the pattern and the light and lines, must have been a fantastic experience traveling there. @domenicododaro, this is gorgeous. @graemestevens you are right a must on black. I'm enjoying your sand, keep 'em coming. 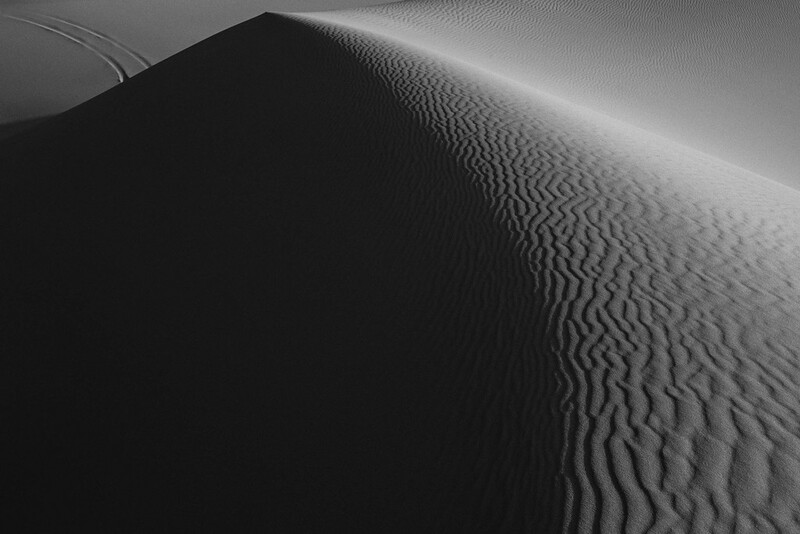 I love dune photos. Nature and man-made in sync. Nice. Wow - I just fav'd and commented as 5Plus2, I am sorry! I promptly undid it and logged out. But I was saying: this is visually stunning Domenico! :) A huge fav, it is beautiful. Wow! This is a beauty! Fav. So many layers to this. I see more each time I look. STUNNING !!!!! Where are you taking these amazing photos? Wonderful sense of size and permanence - but then there's that motion. And I like the signs of man in the background. @overalvandaan it was! I admit I was scared before leaving, because it was so full of expectations, and I figured they could be deluded... on the contrary, I fell in love! @graemestevens thank you very much! @craigwantsnack thanks a lot, Craig! @golftragic thank you so much, Marnie! A few of them still to come! @yaorenliu thank you for noticing. I think the car track makes the shot! @kerosene hahaha. Why deleting? Lol. Thank you very much, friend! @seattlite thank you so much, Gloria! @kmwilliams thank you indeed, Kate! @gardenfolk too kind of you, thanks! @twofeet thank you, so is the desert to my eye! @jyokota it was ages ago, in 2008-2009, South-western Libyan Sahara. Thank you a lot! @robz tank you very much, that car track is crucial to me! @domenicododaro Where is this my friend? are you travelling at the moment? @pistache Thank you very much! @adi314 I would love to! No, the photos are from a trip to the Libyan Sahara in December 2008-January 2009. I wish it was possible today. Fantastic composition again. Those car tracks add so much in addition to the natural and ever changing forms. Luscious, not the normal description of sand but it fits. Fav. @mona65 Thank you so very much! @joysabin I admit it! Thank you a great deal fo the fav! @helenhall Thanks a lot, Helen! @yrhenwr Oh well, I'm really humbled. Thank you so much!